The multinational company has taken advantage of the occasion to present the 2016 version of its software and its spectacular virtual reality motor to the more than 40,000 visitors to one of the major fairs of the sector, where it made 50% more contacts than at the previous fair. Lantek, leaders in the development and marketing of CAD/CAM/MES/ERP software solutions for the metal industry on a global level, has, once again this year, been one of the exhibiting firms of the Machine Tool Biennial (BIEMH), which has recently been held in Bilbao. This is one of the reference meetings on the calendar of the sector, which this year, has received more than 40,000 visitors, who have verified the latest novelties first hand, including the updated versions of all the solutions that Lantek offers machine tool companies. Joseba Montoya, chief officer for Lantek Spain and Portugal, has described the fair as a resounding success: “this week we have established 50% more contacts than at the previous BIEMH, held 2 years ago. The manufacturers who attended the show have given a very positive evaluation of our offer of solutions, which converts us into fundamental drivers to promote advanced manufacturing and Industry 4.0 in the metal sector”. To prove its capability in this area, Lantek demonstrated, in a spectacular virtual reality environment, a simulation of the production processes managed with Lantek Factory. 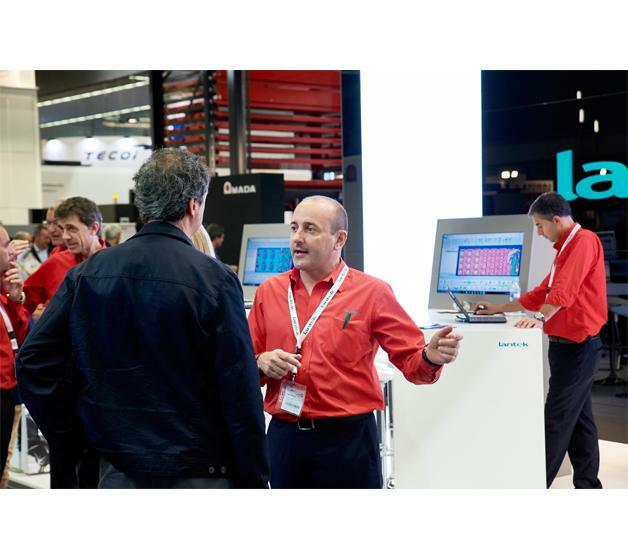 Lantek presented its product portfolio at BIEMH, which includes, among other aspects, the most advanced CAD/CAM software on the market, able to manage any machine or technology. “Out of all our solutions, customers have expressed special interest in the 2016 version. A considerable number of consultations were registered to learn more about the novelties of Lantek Expert and Lantek Workshop”, explains Joseba Montoya. Lantek is one of the firms that regularly exhibits at this biennial, which has registered a 13% increase in the number of visits and that, during one week, has hosted more than 1500 exhibiting firms and 2605 products, generating an economic impact of 36 million Euros. BIEMH is the most important meeting for machine tool companies located in the Iberian Peninsula, but it also attracts visitors from more than 54 countries. According to Joseba Montoya, “every two years Bilbao plays host to the sector where the new advanced manufacturing needs and tendencies can be seen and, within this framework, it is there where we at Lantek, provide our intelligent solutions for manufacturers and suppliers”. Lantek has also used the Machine Tool Biennial to establish a new meeting point with the machine tool manufacturers, a sector that it offers global deployment capacity with local support. “We have an ample offer of products for the different machines and technologies, thanks to our great innovation capacity”, underscores Joseba Montoya .